We’ve recently been trying out a service called Parsec which allows you to stream a game and have friends play along remotely, and we’re happy to be able to give it the Official Powerhoof™ Severed Thumbs Up of Approval®! Parsec lets you stream a game and have friends watch and play along with their own controllers. Latency was my biggest worry, but it wasn’t a problem when we played, certainly no worse than our dodgy indie implementation of online multiplayer would have been! If you want to try it out yourself, there’s more details here. In case you hadn’t noticed the fancy widget, we now have an official discord server. 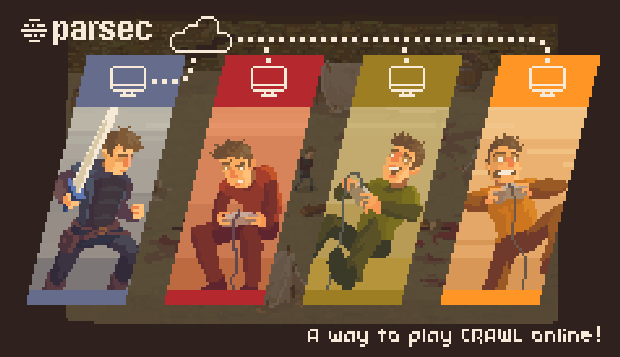 Come chat to us about things, or find someone to play Crawl with! I’ve used this myself in the past, and my laptop is absolute garbage. Works absolutely fine. I totally recommend Parsec to anyone playing Crawl. Do you ever plan on making your own multi player co-op mode in the actual game in the future or not. I would 100% prefer your version of that once fully implemented instead of using some weird site which I first have to download and still then create an account and then wait for my friends to do the same. I will wait for the steam multi co-op no matter how long It would take you guys. There’s no rush but as a side project please do something about that. If not please explain why this is an issues so I can have a better understanding of your team’s situation thanks. Alas, we have no plans to integrate online multiplayer in future. We had hoped to early on, and worked on the feature for a while, but it’s not a trivial feature to add and officially support, and unfortunately we had to decide to leave it out. Thank you for your honesty. I hope 1 day in the far future you may reconsider, I would also like to know more such as the main issues and challenges of implementing it that made the team come to this final conclusion. I would also like to know what are the future plans of this great game and others to come. But basically, all interactions in the game have to be re-written and re-designed with networking in mind for it to function well, and it would just take way too long (as in, we could make a whole new game in that time instead) and either be quite a different game, or not play that well. Parsec is a pretty good way to go really, the only issue really being that you need pretty good bandwidth to play. Thanks again. I wish you and the team the best of luck in making games and in life. Yup, we were hoping to have more bosses, unfortunately the second and third bosses each took a good 6 months of solid work 🙁 Delaying things by 6 months for one more, or a year for 2 more didn’t make sense to us, and frankly would have driven us crazy after the years crunching to get everything ready for launch! What’s the next game your working on? Early days yet but Barney’s been working on a stylish combat platformer thing, and I’m messing around with a thriller adventure game project. We’ve been doing little game jam things too, have another one this weekend! I’ll have to post an update on here soon!